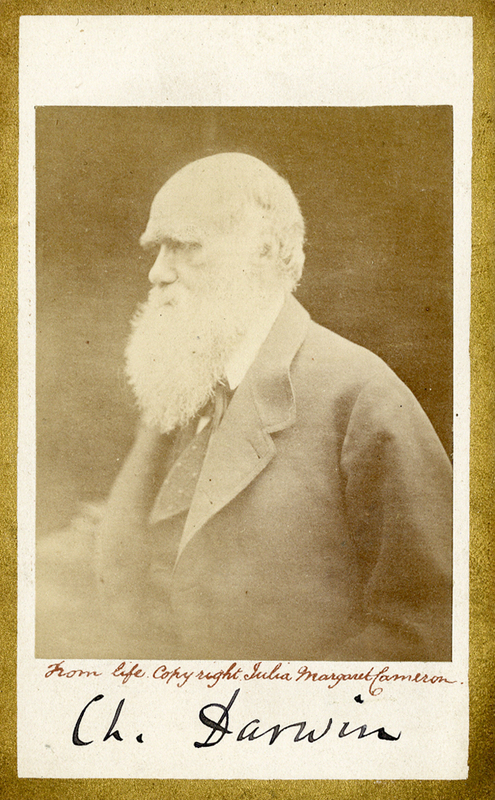 Albumen print on paper (2¼ x 3½ in. ), carte-de-visite mount with gold lithograph gold border. Inscribed by Cameron “From life Copyright Julia Margaret Cameron.” Very good condition. “She received the whole family with open-hearted kindness and hospitality, and Darwin always retained a warm feeling of friendship for her. When they left she came to see them off, loading them with presents of photographs. Moved, Darwin said: ‘Mrs. Cameron, there are sixteen people in this house, all in love with you.’ Darwin paid her for her portraits of him, and as the Camerons had by that time lost a great deal of money through the continued failure of the coffee crop, she gladly accepted payment and ran boasting to her husband, ‘Look, Charles, what a lot of money!’” (Gernsheim, Julia Margaret Cameron).